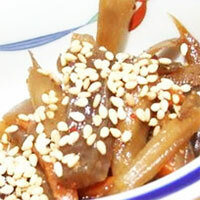 Kinpira Gobo actually translates as braised burdock root. It is a vegetarian dish, consisting of thin strips of burdock root and carrot and optionally red peppers. The trick for preparing this meal is in presoaking the burdock root strips in vinegar water. The burdock rot is fried first using vegetable oil, adding the carrot and the peppers a few minutes later. It is commonly seasoned with sake, sugar, mirin, soy sauce, and roasted sesame seeds. Kinpira Gobo is a very good choice of meal for someone on a diet, as it is entirely made from vegetables. Besides being savory, it is also very healthy and nutritious. The calories in Kinpira Gobo per 79.1g(1 small bowl) is 97 calories. Kinpira Gobo is calculated to be 123Cal per 100 grams making 80Cal equivalent to 65.04g with 14.25g of mostly carbohydrates、3.07g of fat、1.19g of protein in 79.1g while being rich in vitamins and minerals such as Vitamin A Retinol Equivalent and Folate.